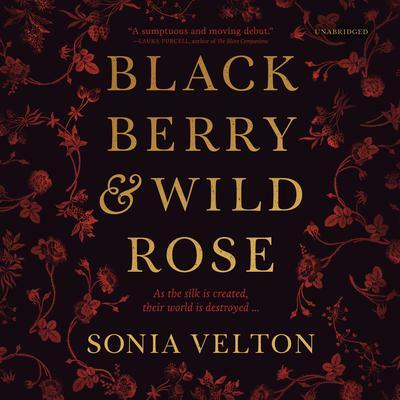 Set in eighteenth-century Spitalfields, London, Blackberry and Wild Rose is the rich and atmospheric tale of a household of Huguenot silk weavers as the pursuit of the perfect silk design leads them all into ambition, love, and betrayal. When Esther Thorel, wife of a master silk weaver, rescues Sara Kemp from a brothel, she thinks she is doing God’s will, but her good deed is not returned. Sara quickly realizes that the Thorel household is built on hypocrisy and lies and soon tires of the drudgery of life as Esther’s new lady’s maid. As the two women’s relationship becomes increasingly fractious, Sara resolves to find out what it is that so preoccupies her mistress … Esther has long yearned to be a silk designer. When her early water colors are dismissed by her husband, Elias, as the daubs of a foolish girl, she continues her attempts in secret. It may have been that none of them would ever have become actual silks, were it not for the presence of the extraordinarily talented Bisby Lambert in the Thorel household. Brought in by Elias to weave his master piece on the Thorel’s loom in the attic of their house in Spitalfields, the strange cadence of the loom as Bisby works is like a siren call to Esther. The minute she first sets foot in the garret and sees Bisby Lambert at his loom, marks the beginning of Blackberry and Wild Rose, the most exquisite silk design Spitalfields has ever seen, and the end of the Thorel household’s veneer of perfection. As unrest among the journeyman silk weavers boils over into riot and rebellion, it leads to a devastating day of reckoning between Esther and Sara. Esther has long yearned to be a silk designer. When her early water colors are dismissed by her husband, Elias, as the daubs of a foolish girl, she continues her attempts in secret. It may have been that none of them would ever have become actual silks, were it not for the presence of the extraordinarily talented Bisby Lambert in the Thorel household. Brought in by Elias to weave his master piece on the Thorel’s loom in the attic of their house in Spitalfields, the strange cadence of the loom as Bisby works is like a siren call to Esther. The minute she first sets foot in the garret and sees Bisby Lambert at his loom, marks the beginning of Blackberry and Wild Rose, the most exquisite silk design Spitalfields has ever seen, and the end of the Thorel household’s veneer of perfection.